If you’re already familiar with the beauty and history of East Perthshire you’ll no doubt be enjoying the many varied events and activities which are taking place around the Cateran Trail, a 64 mile (103 km) scenic circular walk in the heart of Scotland. If not, then you’re in for a treat and the joy of discovery awaits. The Cateran’s Common Wealth is an innovative and ambitious project which has been in the planning since 2014 and March 2017 saw the launch of their inaugural programme of events and activities. A programme of diverse arts, cultural and heritage activities all aimed at celebrating and sustaining the Cateran Trail’s abundance of common wealth, history, heritage, myths, legends, the many cultural and creative practitioners who already live and work around the Trail as well as it’s outstanding natural beauty and biodiversity. The programme will appeal to everyone of all ages, locals and visitors from near and far. Sat 1 July sees the opening of the exhibition The Story of the Cateran Trail in 100 Objects at Alyth Museum. Launched in November 2016 with a campaign to crowdsource ideas for 100 objects that tell the story of the Trail’s history right up until the present day. Folk who live and work around the Trail and those who visit were asked to propose people, places and landscapes and objects associated with them, that they believe tell an important part of the story of this part of Scotland. The final 100 Objects were chosen in April 2017 by a Community Panel Chaired by Councillor Bob Ellis and form the basis of a new booklet, an Exhibition at Alyth Museum which opens Sat 1 July, new itineraries aimed at visitors to the area and a set of teaching resources for local Primary Schools. There are various Walks & Talks events to join in and you can download their Walks & Talks Leaflet for all details, and the rolling calendar of events can be seen by clicking through to the Take Part section on their website. The What’s Planned page on their website details a bit more about the first three projects including the fabulous recently launched Story Box, a new community-led oral history archive, launched in May in Alyth Market Square, tells the stories of the present, past and future of the people of Alyth and surrounding areas. Another ongoing project which has been underway since March 2017 is the work of resident artist Deirdre Nelson. Deirdre is a renowned textile artist who has worked with many varied groups throughout Scotland. Her involvement with the Cateran Trail has included working with various local schools and groups around the Cateran Trail, who have all been involved with ‘Stitching the Trail’. 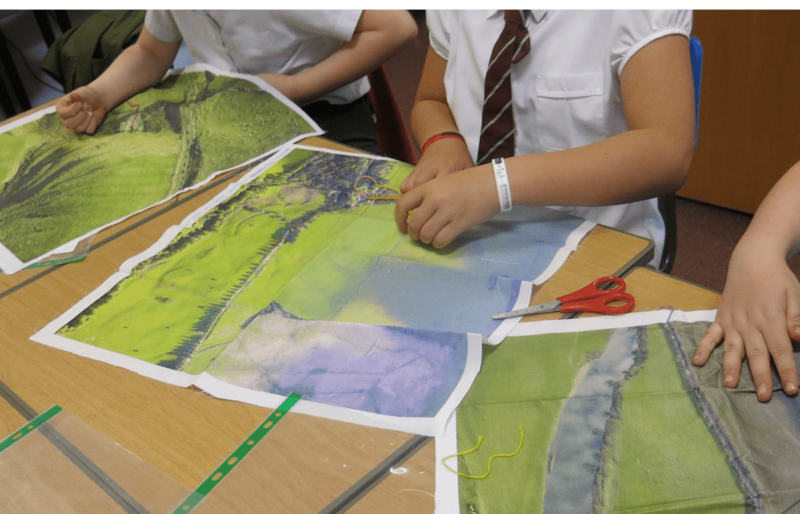 Different projects have included creating bunting and cushions by hand stitching onto digital printed fabric featuring ariel images of the area. There’s always something new and exciting to keep up with regarding the The Cateran’s Common Wealth, one of the easiest way is to follow them on their links on Twitter, Instagram and Facebook, and in the meantime you can visit Alyth Musum to see the exhibition of The Story of The Cateran Trail in 100 objects.